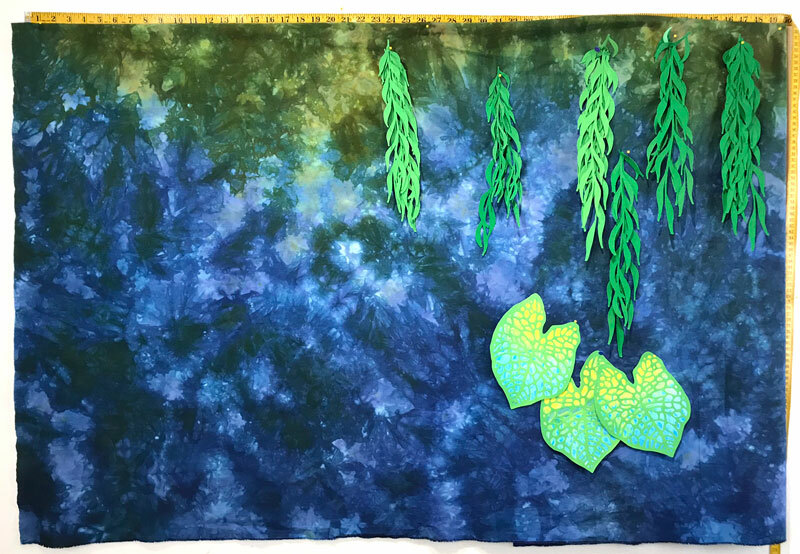 I recently had a customer contact me wondering if I could make a quilt similar to my “Lagoon” quilt for her. 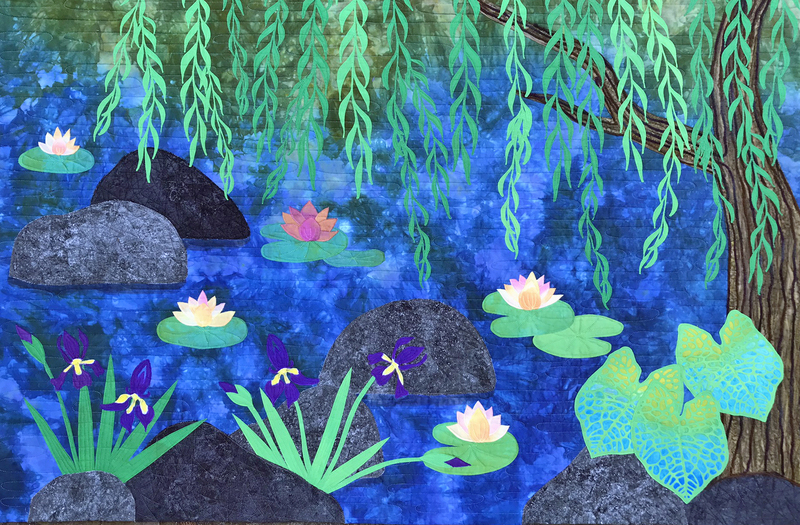 Those of you who are members of the Artful Quilting Course will recognize this quilt as the culminating project in the Landscape Lesson. Here is an image of the original work which sold last February. I sent her images of background fabrics I had in stock but none were quite what we needed for this project. I contacted Lisa Reber who worked her magic again. 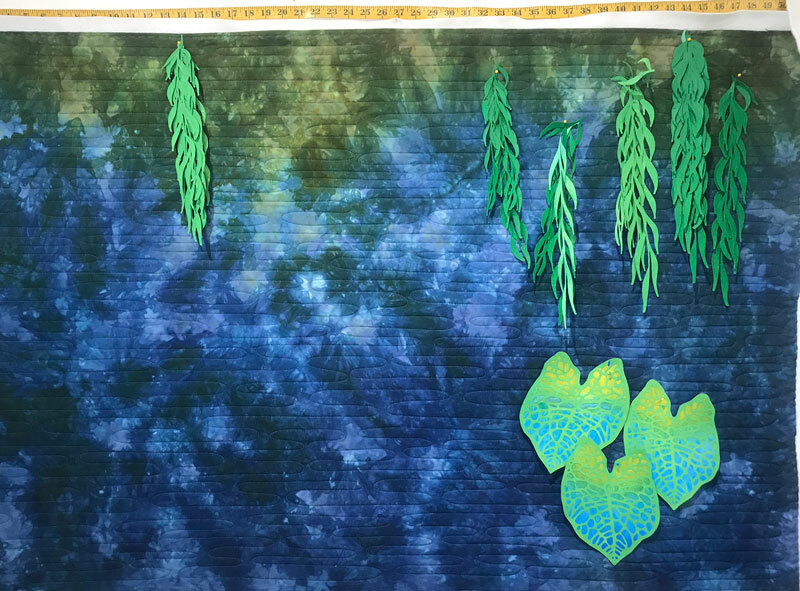 She came up with a blue green that was slightly darker but definitely beautiful and workable for this project. You will also recognize the leaves as the image I gave you as a download. They are a top layer of painted Evolon cut out by my Cricut machine. 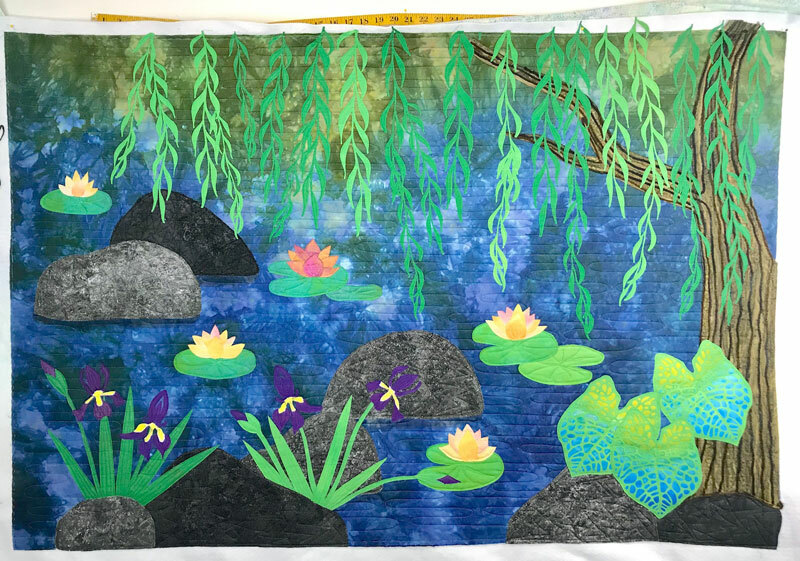 I had painted the under layer of habotai silk with yellow and aqua as you see above. When I saw them against the darker blue background they seemed almost neon in color. I took the layers apart and gave the silk layer a thin wash of medium blue transparent paint. They then looked much better against the deep blue. 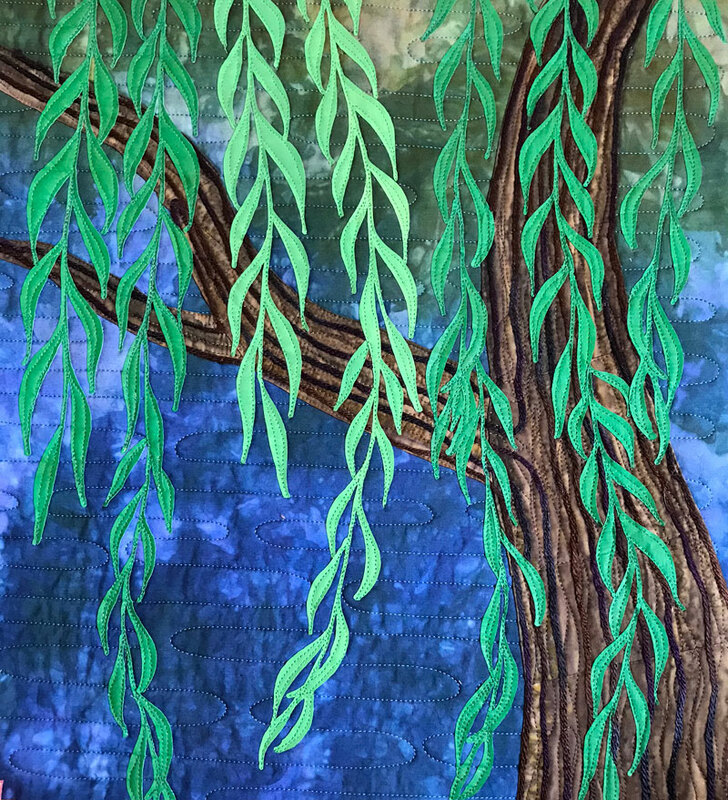 The willow leaves were also painted Evolon using my own image scanned into and cut out by the Cricut machine. I used my usual Northcott Stonehenge fabrics for the rocks. 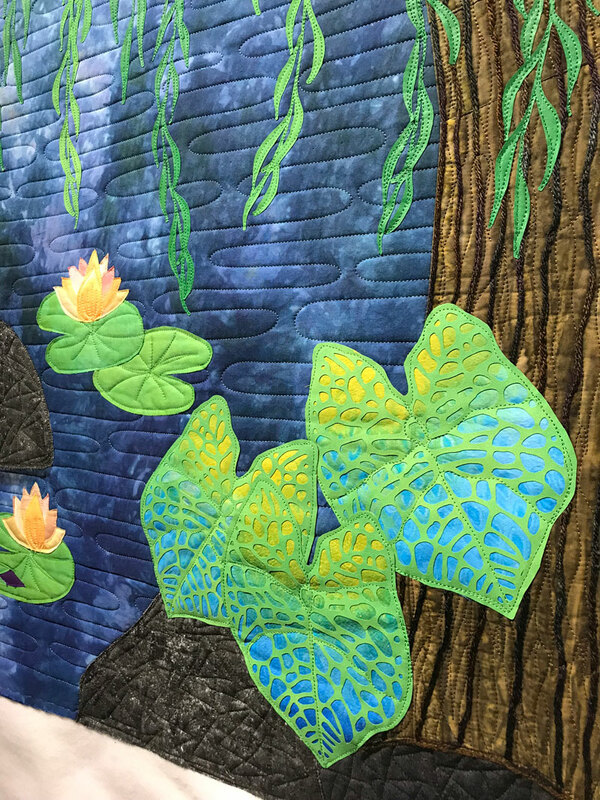 My customer requested that this quilt be somewhat smaller than the original to fit her space. As a result, the arrangement was somewhat different. My tree trunk fabric was on order so in the mean time I continued make all the other elements. The iris and their foliage was all constructed out of Evolon this time. 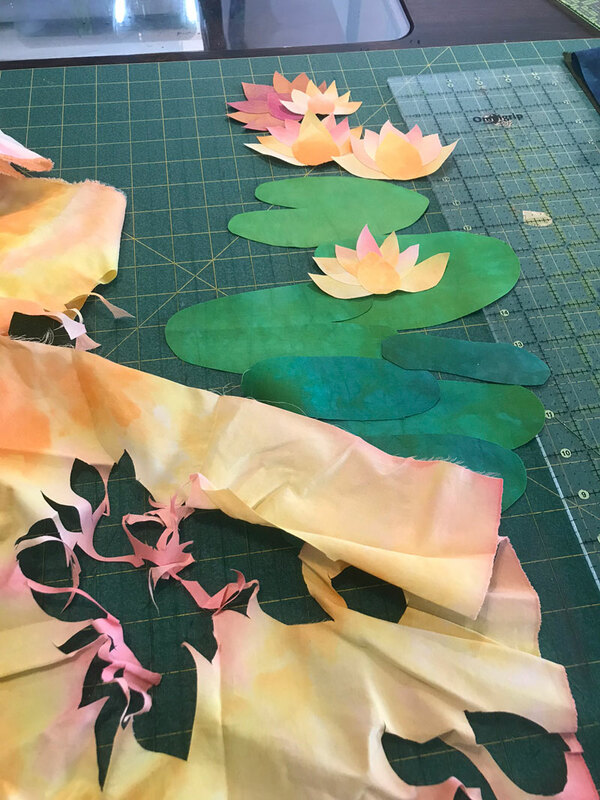 I found it easier than using fabric for those long leaves – no fraying. 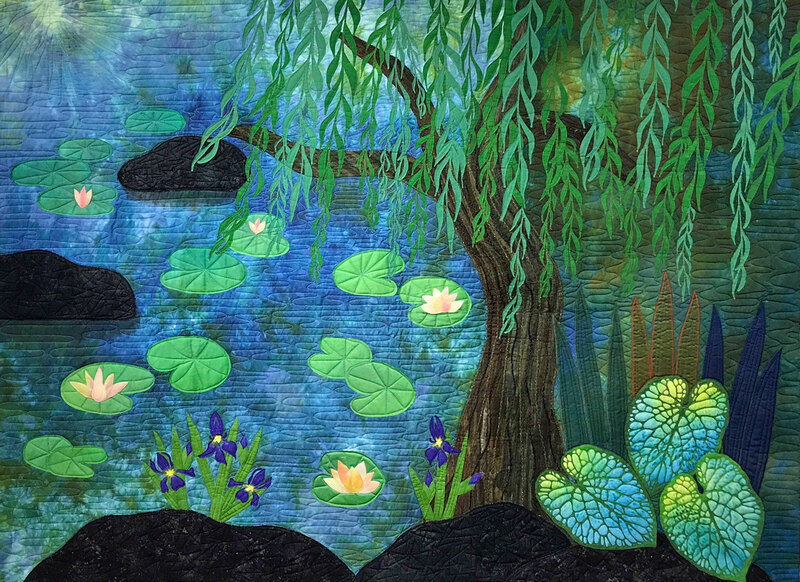 In this image you can see that I quilted the whole background with an loose water effect. It was much easier to do this step first than to quilt around all those little willow leaves. All the elements of the quilt were still just pinned on at this point. 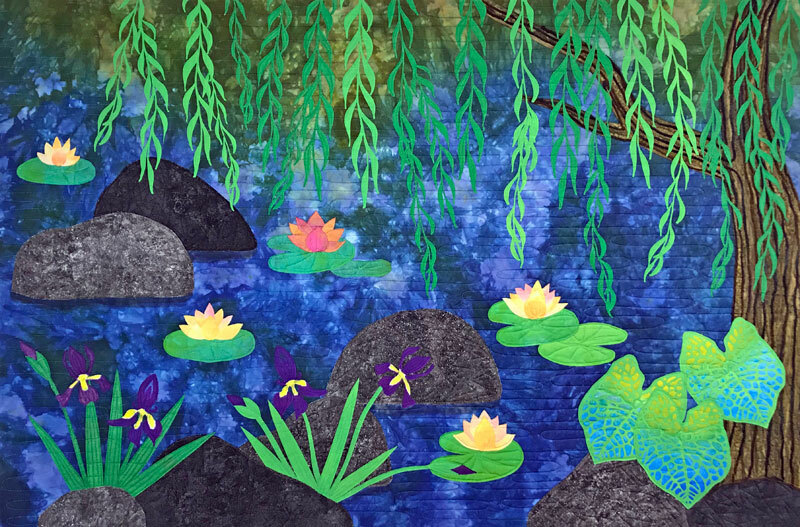 I used the same silk radiance fabric from Lisa Reber which I had used in the original quilt for the lotus (lily?) blossoms. The fabric already had Mistyfuse on the back and I fussy cut the petals. I arranged them on parchment paper and ironed them down. That way they stayed as a flower unit but I could still rearrange them on the quilt for placement. The tree fabric, a striped batik, finally arrived so I made quick work of putting in the darts (just like dressmaking darts) to give it some curves and character. I couched yarn down onto the tree trunk using my new couching foot for the Innova. It was SO much easier than the old couching attachment. Thank you Innova!!! I made quick work of stitching down all those willow leaves. 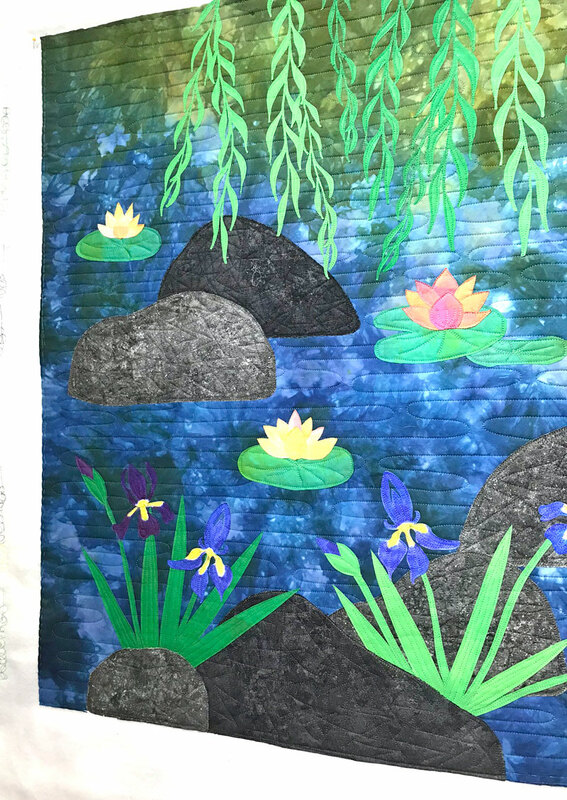 Placement of the lily pads and rocks was fun. They all had Mistyfuse on the back so a blast of steam from my iron held them in place while I stitched them all down. The iris leaves and stems were tucked under the rocks. I had a lot of trouble figuring out a color for the iris to make them show up better. Adding a little fuschia helped but they were still too dark. Here you can see it all done except for the binding. I over painted the iris several times with more fuschia in the purple so they would show up better. They were still a bit dark but better than the blue against blue. Here is a close up of the large leaves. They are not yet pressed in this image so they look quite 3 dimensional. You can see the curvy quilting and couching on the tree trunk, as well. This is taken in the studio under lights. This was taken outside in natural light in the shade. The natural light makes the colors just glow but the studio lighting brings out the stitching in some interesting ways. 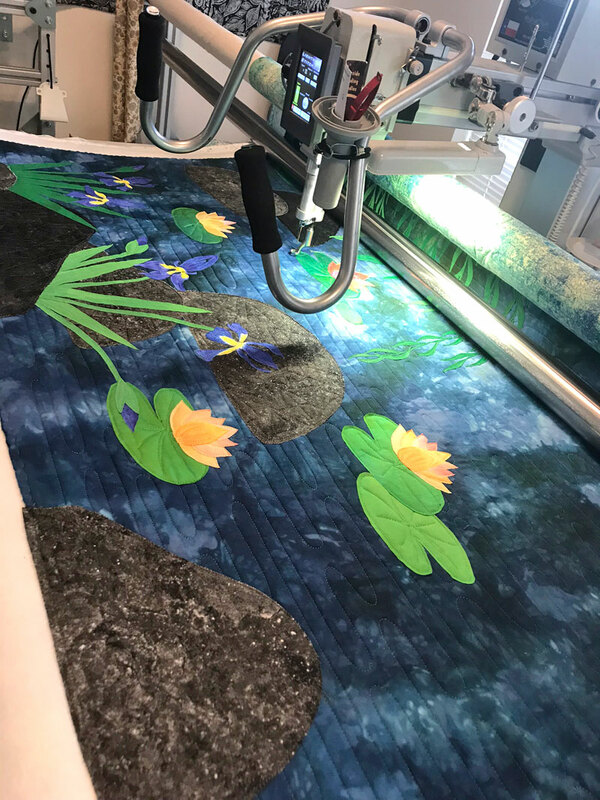 If you are interested in learning more about the Artful Quilting Course or more details about my quilting and sewing journey you may do so here. I would love to get your feedback on my process and I’ll be happy to answer any questions. Just leave a comment below. My thoughts are….amazing! The detailing you did on the different plant leaves is really nice! The colors are perfect and bright. 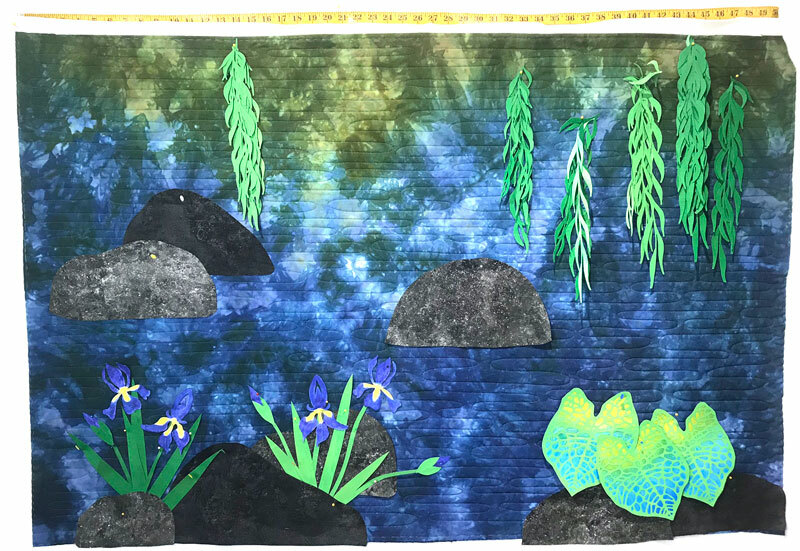 The contrast between the water, plants and rocks just perfect…..the entire piece just makes me feel happy and smile!! Thanks so much, Elaine. We can all use a little extra happy right now!